In a world of ever increasing financial complexity, a Financial Counselor can serve as your financial "coach", who works as a generalist rather than having a specific area of expertise. The Counselor is able to understand and coordinate the work of all of your financial experts in order to assist you in the development of your financial game plan. 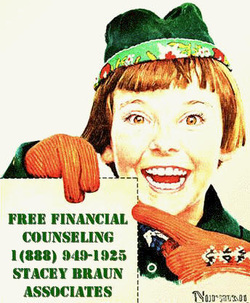 Stacey Braun Associates, Inc. Financial Counseling Program provides you with access to qualified professionals, such as Certified Financial Planners and Registered Investment Advisors who can help you achieve your financial goals. Whether you need a comprehensive financial plan or an answer to a financially related question, Stacey Braun’s professionals are available to work one-on-one with you to provide quality assistance. Call Stacey Braun at (888) 949-1925. A Stacey Braun representative will be in one building each month between 10am & 2pm. Stop by for a brief consultation. At this meeting, you and a Stacey Braun associate will determine when and where you will meet for your full consultation, as well as what you need to do to get the most out of your session. Financial advice is tailored to meet your needs and is based on your circumstances. "After this meeting I am strongly considering requesting Stacey Braun Associates to handle my financial accounts. Thank you!" "Very Satisfied! Counselor was excellent!!" My expectations "were exceeded!" Consultant was "extremely helpful"
Counselor was "terrific. He asked good questions, was patient & very knowledgeable. He had such a broad knowledge base to help with all our finance questions." "I knew the answers to my questions but good to have a second opinion"
"Counselor was very knowledgeable & helpful, answering any questions no matter how small. Helped in understanding my 403b & advice on what funds my money should be in. Thanks for the advice. I look forward to using your service next year!" "Excellent consultation - very, very informative. Easy to understand - personable consultant. Hats off to the consultant for an excellent, caring, thorough job!" The Omni Group - Everything you need to know about 403bs!!! UPromise - a college savings service that harnesses the purchasing power of parents, extended family, family, and students to make it easier to pay for college.